It didn’t take Lod long to repair Avingard’s iron armor. The armor had seen better days, and Avingard was sure the Orc that wore the armor previous was involved in many fights. Still, the armor would have to last until Avingard could either find a replacement piece, or have enough gold to afford a new one. 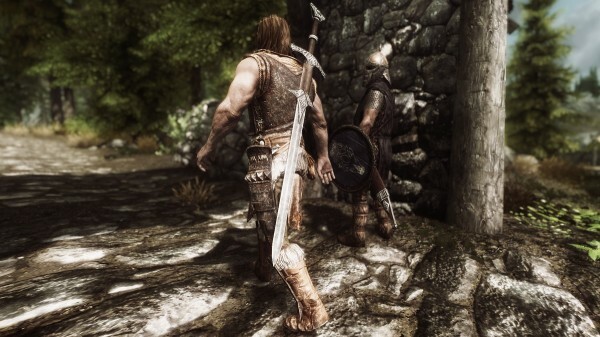 As Lod pounded out the dents from his iron armor Avingard thought about whether he should just travel to Solitude instead of going to Whiterun. While Whiterun was closer, it was further, which would take him farther from Solitude. Still, if the trek to Solitude was dangerous, which was the impression he has received from rumors he has been hearing, he would stay with his initial thought of getting supplies in Whiterun. Avingard was getting tired of all his second guessing and was happy once Lod had finished his repairs. Avingard thanked Lod and left the forge. He traveled south out of the same exit he left the previous day enroute to Cracked Tusk Keep. The town guard kept a watch on Avingard as he walked past until he disappeared down the road. Avingard reached the small passage way through the trees to went west to Cracked Tusk Keep. He paused for a moment to relive some of the battles from yesterday before continuing to the north. The road was surround on both sides by tall, mature trees that, but not so dense as to hide anything from Avingard. He has heard stories about the wildlife of Skyrim, and was constantly on alert from predatory animals. As he continued to walk a large stone structure started to rise up out of the trees on his left. Avingard stopped for a moment to analyze the structure and to see if he could see any additional structures to may belong to this tower. 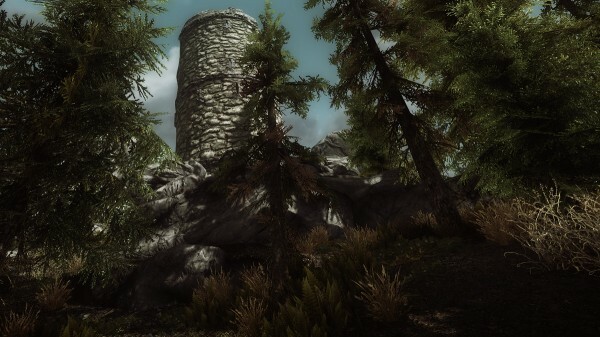 Avingard couldn’t make out much through the trees, nor could he see a path that led to the stone tower. The sun was still shining brightly in the sky, as there wasn’t a lot of clouds, so nothing could be easily hidden from his view. Finding no pathway where he stood, Avingard decided to continue along the road, perhaps finding such a pathway further along. As he walked along be eventually noticed a mill off to his right. There appeared to be a mill building along with a house and a small chicken coop. A storage shed appeared to also have been build back near the mill. While entering the mill was tempting, Avingard realized he had a fairly long journey ahead of him so he decided to pass by the mill and continue north along the road. Just north of the mill, along the road, a Redguard came running south towards Avingard. Being somewhat startled by the main, Avingard quickly placed his hand upon his sword that was placed on his back. The Redguard didn’t give any motion that he was going to draw his weapon but instead just stops in front of Avingard. “Slow down. Explain yourself,” Avingard replied now holding the mace. At this point the Redguard turns around and heads north, sneaking as he went in an attempt to not draw any attention to himself. Avingard decides to follow the man north along the road to see where he went. Unfortunately, the Redguard moved rather quickly and Avingard couldn’t keep up and eventually lost the man. Suddenly out of some bushes to Avingard’s left came a second man, this time it was a Nord. He looked upset. “Did you see someone run pass just now?” the Nord enquired. The Nord’s eyes widened when he noticed the mace that Avingard was holding. “I presume this iron mace belongs to you?” Avingard asked when he realized that the Redguard was probably a thief that had stolen the mace from the Nord. “Yes. How did you get his?” the Nord started to ask. “Uh…nevermind. Here it’s not much but it’s something.” The Nord hands Avingard some gold coins in exchange for the mace. After the Nord disappears around the bend Avingard continues along the road. Suddenly he sees an arrow fly past, followed by some hollering. As Avingard moves to the side of the road, the Redguard thief runs past Avingard in a panic. Not far behind the thief the Nord has his bow drawn and releases an arrow. The arrow strikes the thief in the arm, but he continues to run for his life from the Nord. Eventually, both men disappear down the road with the screams from the thief and hunter still be heard. Avingard looks around to ensure there is no one else around, and then starts off north along the road.